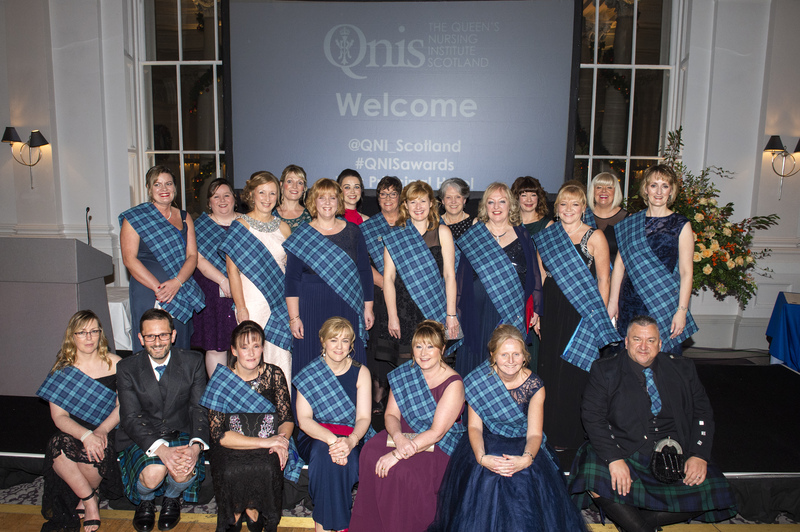 The QNIS annual awards dinner was held on Thursday November 29th in Edinburgh, with 21 community nurses receiving their Queen’s Nurse title. 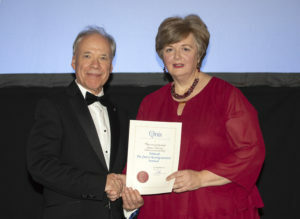 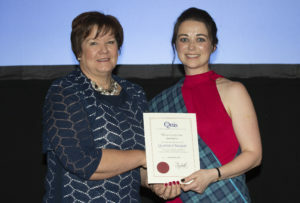 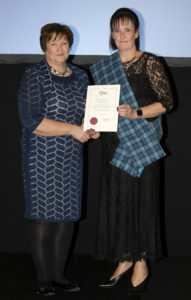 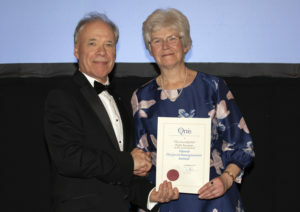 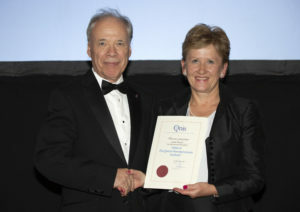 Scotland’s Chief Nursing Officer (CNO) Professor Fiona McQueen presented the badge and certificate to the new Queen’s Nurses while QNIS Chair Professor Sir Lewis Ritchie awarded four Fellowship awards. 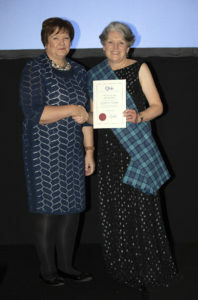 Celebrations started with a procession into the hall at the awards ceremony at The Principal Edinburgh on George Street hotel. 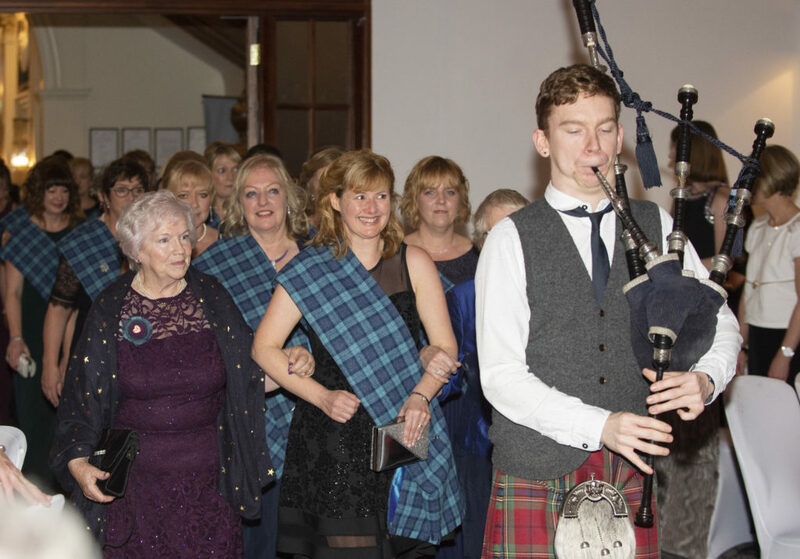 The new Queen’s Nurses, each wearing a specially commissioned Harris Tweed sash, entered the room led by two retired Queen’s Nurse and a piper piping Highland Cathedral. 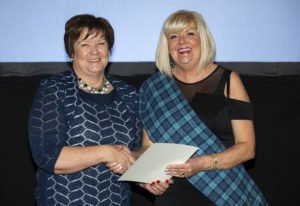 It was a moment symbolising two generations of Queen’s Nurses united by their commitment to compassionate nursing care for the people of Scotland. 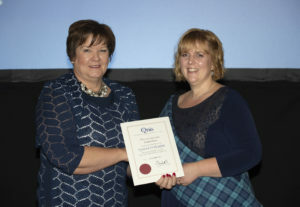 Clare Cable, Chief Executive and Nurse Director of QNIS, who hosted the evening’s proceedings, introduced the group to the room and offered a warm welcome to all guests. 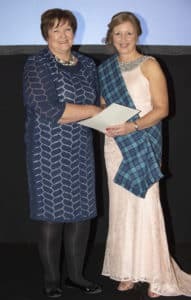 Each Queen’s Nurse received a beautifully hand written certificate scribed by master calligrapher David Lang and signed personally by QNIS Patron Her Majesty the Queen. 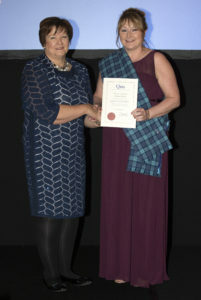 All those receiving awards were given specially commissioned silver badges, designed, crafted and hand enamelled by Ortak in Orkney, and assayed in Edinburgh. 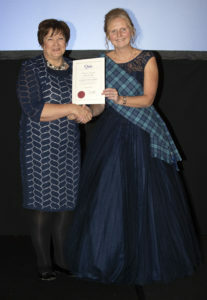 After all 21 Queen’s Nurses took to the stage to be handed their award, it was the turn of the Fellows. 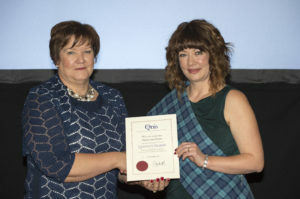 The award of QNIS Fellowship aims to create a community of support for the Institute which will provide expert advice, on practice, education, research, policy and integrated care. 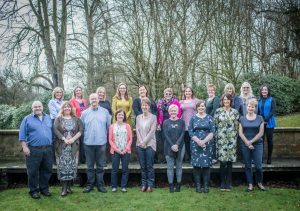 It is hoped that our new Fellows will act as ambassadors for our work, as well as, benefiting from a renewed relationship with us. 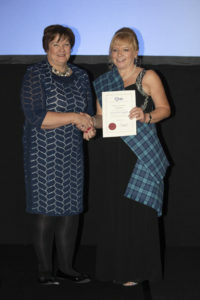 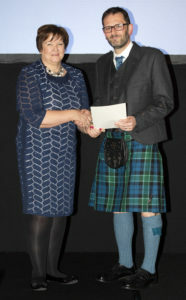 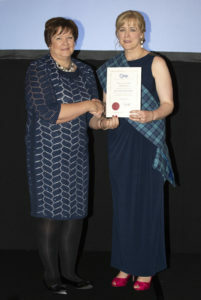 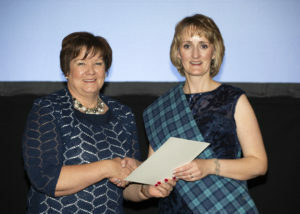 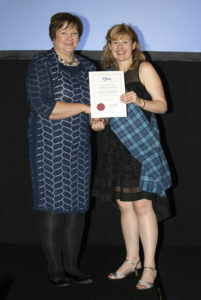 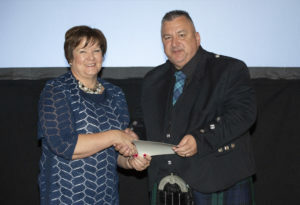 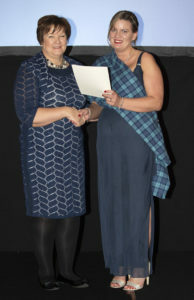 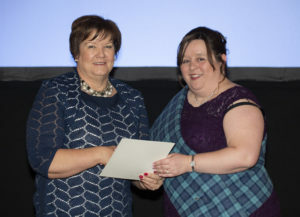 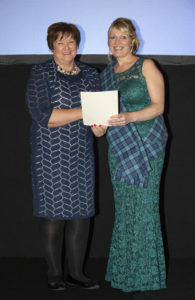 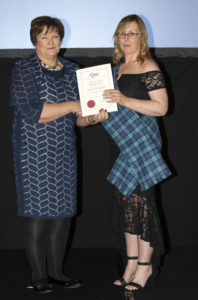 First to receive her Fellowship was Linda Harper, NHS Grampian’s Associate Nurse Director Practice Nursing /Lead Nurse for Moray HSCP. 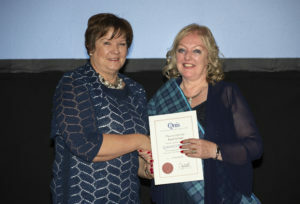 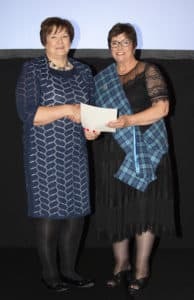 Dr Alison O’Donnell, a retired nursing lecturer and a member of the QNIS History Advisory Committee, received her Fellowship award alongside Dr Phyllis Runciman, a reitred senor research fellow. 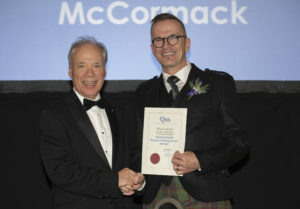 Finally, an Honorary Fellowship was awarded to Professor Brendan McCormack, Head of Division of Nursing at Queen Margaret University.